Not only is The Avalon Cleanse relatively easy to follow, but if you, like me, have tried any other form of ‘cleanse’ in the past (apples, maple syrup+pepper, green goo) you know how awful the experience can be, coming in AND going out. 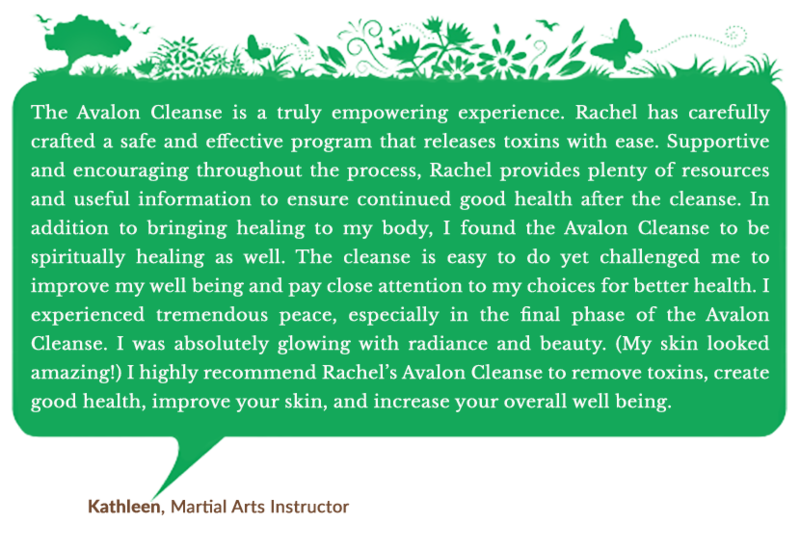 The Avalon Cleanse is “light” in the sense that it isn’t hard to do while leading a normal life, i.e. working or eating out. No blenders full of green sludge to choke down, no sandy twig bars, just wholesome foods in moderate proportions, along with a regimen of herbs and enzymes. There are some parts that can be a bit trying at the end, but not especially uncomfortable. That is when it all comes together and your system gets a full reset, which is just what the doctor [should have] ordered. The cleanse was a very rewarding and centering experience. It allowed me to keep my diet (and subsequently my life) very simple and focused. I found it a lot less intrusive or drastic than other programs, which allowed my body to detoxify with grace and gentleness. Over the weeks I was able to look at my habits, good and bad, with a renewed sense of clarity and realism. It was truly wonderful and I fully expect that I will do the Avalon cleanse with each seasonal change. 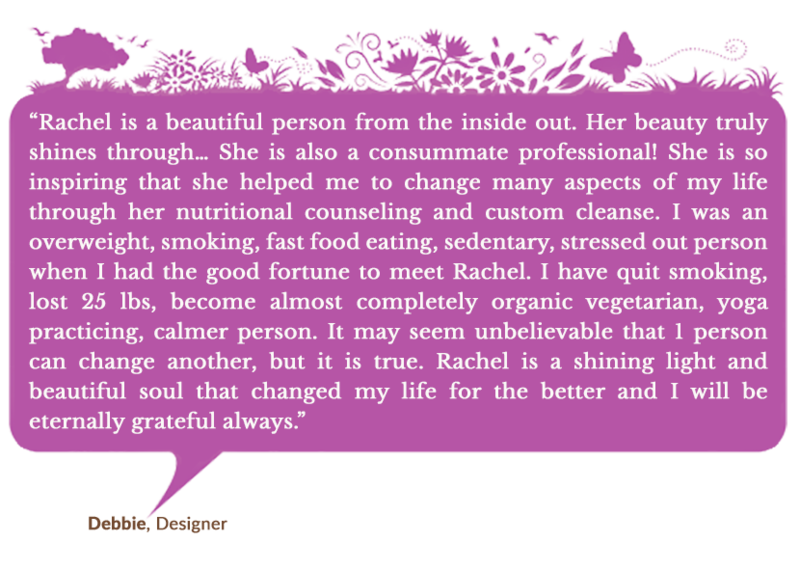 Rachel’s passion for empowering others to achieve optimal health was obvious from the very beginning of the counseling process. During my cleanse and follow up, it felt as if Rachel was right beside me, consistently expressing encouragement and offering practical solutions to my daily challenges. In addition, she gave me useful information related to my specific health issues and quick and easy wholesome recipes customized to my tastes and needs. Her gentle but focused presence always inspired me to keep moving towards my goals, even through the difficult parts! The cleanse was relatively easy to do, because I ate 3 meals a day, with 2 snacks, which made this program very unique. As a result of this program and Rachel’s support, I lost some weight, changed my eating patterns, and drastically reduced my cravings for the ‘wrong’ foods! I can’t thank Rachel enough! We were impressed by Rachel’s approach, which is confident and supremely well informed, and at the same time remarkably open-minded and non-judgmental. She has a clear dedication to both personal and environmental health, and has a great deal of wisdom to impart about living a holistic lifestyle.